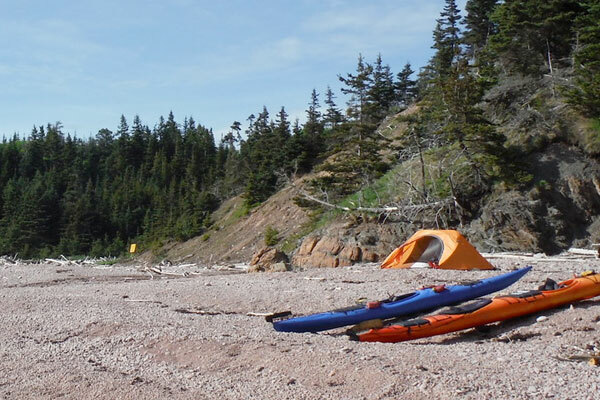 Our three day kayak adventure begins at Spicer’s Cove at the northern entrance to Cape Chignecto Provincial Park or from Red Rocks, paddling to Spicer’s Cove. 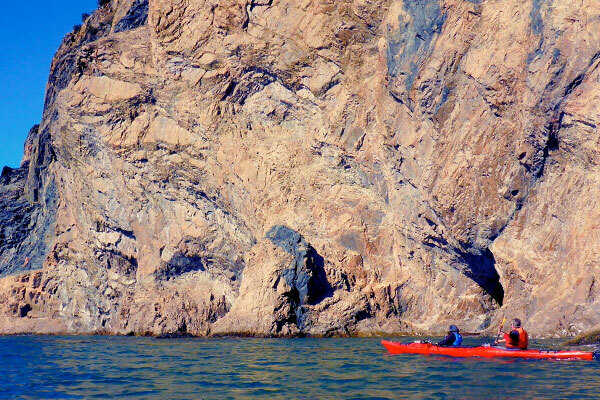 We will paddle the entire Cape Chignecto Park coastline on this tour. You can read a blog from a past guests impressions of this tour here. If paddling from Spicer’s Cove the tour starts with a paddle along the towering conglomerate cliffs and fault lines on the way to the legendary Three Sisters rock formation, checking out the most interesting caves, arches and rock spires as we go – not to mention the elevated beach at Squally Point. After the glaciers retreated 11,000 years ago the land has slowly rebounded 35 meters above today’s sea level! We will explore the Three Sisters either from our kayaks or on foot depending on the tide, then it’s on to the historic lumber and ship building site, Eatonville Harbour. We will spend some time in this area before continuing down the rugged and pristine coastline towards Seal Cove, our beach campsite for the night. Relax on the beach or go for a short hike along the parks coastal trail that offers magnificent views from the top of the escarpment. A little stream gives the option of cleaning off the saltwater while we set up camp and prepare a gourmet supper including a delicious dessert and wine. As we don’t come back this way, we may opt to paddle back to check out the sisters at a different tide level before settling in for the evening. You might wake up in the morning to strange sounds you have never heard before. It’s the Grey Seals bellowing from coves nearby. After a hearty breakfast we are ready to go see the seals resting on rocks in family groups, watched by the enormous males. We keep a fair distance to the wildlife, but still we get a wonderful sensation of being part of something bigger than us. From Seal Cove we continue down the coast exploring formations such as the arch at Keyhole Brook, more sea stacks and on to the Cape of Chignecto. Here we will time the rounding the cape to the tides. On rounding the cape you will see the awe inspiring Devils Slide and then on to the huge sea stack known as Old Sal, marking the entrance to beautiful Refugee Cove where we camp for the night. This area has the highest sea cliffs in mainland Nova Scotia and you will have time to explore the trails if desired. 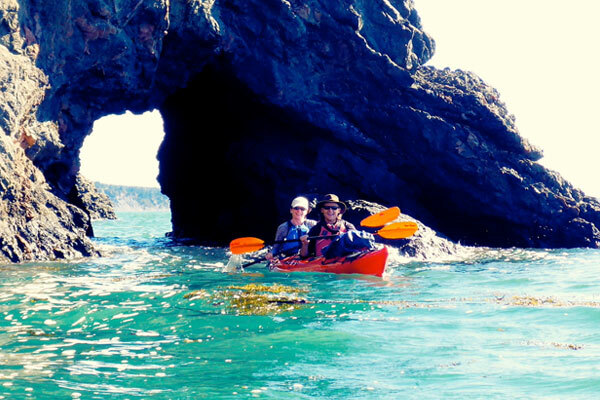 After a night on the beach we continue down the magnificent coastline, taking time to check out the waterfalls and interesting geological formations that are in abundance along this coast, such as the imposing Arch Gulch. Our final stop will be at Red Rocks where we will have arranged to have your vehicles, or a shuttle back to where you left them. 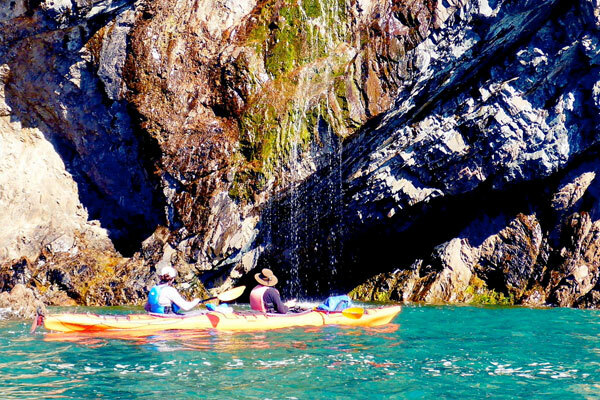 This adventure will allow you to witness the true nature of this fascinating body of water with the largest tides on earth. Your knowledgeable and personable guide will have the time to share his knowledge and love for this dynamic environment with you (not to mention his appreciation for good food) in a memorable setting. We are sure you will want to come back to explore further this wild and rugged part of Nova Scotia, and hope you will! We can offer the Cape Chignecto Adventure tour in July, August and September. Please let us know your travel plans and we’ll do what we can to make your adventure be part of our schedule. We provide 2-person tents and sleeping pads while you bring your own sleeping bag and personal items.  On reservation we give you a full list of equipment and clothing needed. We meet 9 am on the day of the tour for a short briefing where you also get a bag for your personal items. A smaller dry bag is available for your camera. We provide food and water, all safety gear and kayaking equipment. Our Cape Chignecto Adventure has a minimum of 2 participants and a maximum of 6. Beginners are welcome, but you must be in good health and reasonably fit to participate. Please book online or call 1-866-638-4118. Full payment is due upon booking. We will send an equipment/clothing checklist and info about the area plus direction to our departure point in Advocate Harbour. A refund minus a $ 50 handling fee will be possible until 30 days prior to departure after which a refund is available only if you can fill the vacancy. We recommend you get a cancellation insurance. If NovaShores has to cancel there will be a full refund. * All prices are per person/Canadian Dollars before tax. You can pay either by VISA, MasterCard, Debit or cash. We honor the Fair & Friendly Exchange Program.